The Tummy Tub was one of the 'God-sends'. I have many fond memories of bathing Sarah in the lounge in front of the fire, sitting on the sofa. It was a relaxing experience for all of us. No cold bathroom in the middle of the winter, no bright lights....just a warm, dimly lit room with music or the TV in the background. It was also something that was 'mainstream' but really handy for a wheelchair user due to it being portable and of a similar height to the wheelchair. The tub and the stand are separate which makes handling them easier. The stand also has a lid so that it can be used as a stool later on. The advantages of the Tummy Tub are that baby can relax in a familiar feotal position and they are immersed in water up to their shoulders so they remain warmer for longer. Baby feels secure and relaxed - great preparation for a good night's sleep! From an ecological point of view, it also uses less water than if you bathed baby in the bath or sink. I was able to bath Sarah in the Tummy Tub independently, including filling the tub in the kitchen and carryiing it through to the lounge on my lap. Lifting Sarah in and out was fine but I had to be more careful as she got older due to her weight and strength (especially when she clung on to the side if she didn't want to get out!). As you can see from the photographs, Sarah loved to be in the Tummy Tub.......she was so relaxed and sometimes even fell asleep. When she got a bit older, she would splash the water and she even had her 'duckie' in with her! 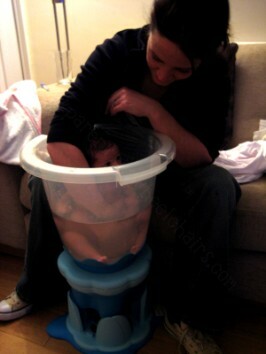 We used the Tummy Tub from birth up until 6 months.